Russet potato ‘Innate’ (for baking or deep frying) from J.R. Simplot Co. approved by USDA without mandatory labeling. AquAdvantage farmed Salmon developed by Aqua Bounty Technologies, approved by FDA who recommended, but did not require, labeling of these fish as GMO. For more information about the GMO salmon and efforts to fight back and mandate GMO labeling on GMO fish, see the Center for Food Safety’s site: centerforfoodsafety.org/issues/309/ge-fish. They are considering suing the FDA over this approval without mandatory labeling. The GMO Innate potato is engineered for processed foods that deep-fry potatoes for French fries, potato chips, and other high-temperature fried potato products. The good news is that McDonalds and Frito-Lay have both rejected this potato. However, it may still be found in the produce section of your grocer. Best to choose Organic russet potatoes. The real challenge regarding this GMO potato comes with fast food and other processed foods. Your best option, for this and so many other reasons, is to avoid all fast and processed foods. If you must give in, look for those labeled by the Non-GMO Project. The GMO salmon is more troubling. 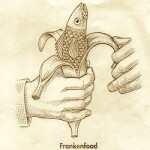 It is the first (but likely not the last) GMO animal approved by our government. It is a fast-growing farmed Atlantic salmon (reaches maturity in only 2 years), allowing the farmer to reap the $$ benefits faster. While some large retailers such as Costco, Whole Foods, and Trader Joe’s have stated they will not sell this fish, like all unlabeled GMO foods, it will be hard to verify what you are buying. This entry was posted on Saturday, November 21st, 2015 at 7:24 pm and is filed under GMO. You can follow any responses to this entry through the RSS 2.0 feed. Responses are currently closed, but you can trackback from your own site.